With its modern Graphite Steel finish, the WM2501HVA Steam Washer by LG has features just as futuristic as its looks. Boasting a 4.2 cubic feet capacity, even the largest loads with the toughest stains are laundered with ease. This steam washer by LG is a large capacity washer, boasting 4.2 cubic feet of space. With a clean, minimalist white finish, it has many features that make it perfect for a busy household with demanding laundry requirements. - True Steam technology: this feature uses steam that can thoroughly penetrate even the bulkiest of fabrics without causing damage to delicate garments. This greatly enhances your washer?s laundry capabilities, and is the technology employed by other features to make your machine a true cleaning powerhouse. - SteamFresh cycle: you get clean, fresh-smelling laundry with minimal to no wrinkles thanks to this feature. - SteamWash option: even other cycles such as sanitary, bulky items, cotton/normal, and permanent press cycles can have the added cleaning and sterilizing power of steam. - Allergiene cycle: Using True Steam technology, your washing machine can now eliminate more than 95% of commonly encountered household allergens found on your clothes and linen. You need no longer worry about dust mites, pollen, animal dander, and other problematic substances clinging to your laundry even after a thorough washing. No need to add bleach or other harsh sterilizing agents to your cycle! - Nine automatic wash cycles: In addition to the SteamFresh and Allergiene cycles, you may choose from sanitary, bulky/large, cotton/normal, permanent press, delicates, hand wash/wool, and speed wash to meet all your laundry needs. - Twelve wash options: anticipating all your needs from start to finish, this machine includes prewash, water plus, stain cycle, load size, extra rinse, and rinse and spin. It also boasts a tub clean feature, automatically cleaning out the interior of your machine and saving you time and effort. - Five adjustable soil levels: choose the setting needed for each load, allowing you to handle even the most stubbornly stained laundry. - LoadSense technology: your washer automatically determines the required water level needed for each load of laundry, reducing water consumption and eliminating guesswork. - Fresh Care Delay Wash: allowing you to preset laundry start times up to 19 hours ahead, this feature gives you the added convenience of being able to run your laundry when it best fits your busy schedule. - LoDecibel operation and True Balance Anti Vibration system: together, these features reduce vibration, minimizing wear and tear on your washer, as well as minimizing noise. - Energy star qualified: this washing machine meets US government requirements for energy efficiency. You?ll have reduced energy consumption and costs. 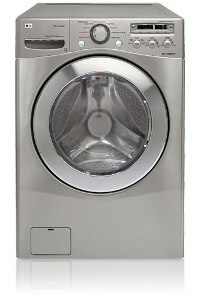 Just like LG?s other washers, this model is extremely energy efficient. It also reduces water consumption, and is perfect for the budget- and environment-conscious consumer. Its cleaning performance is top-notch as well. However, the price range makes this washer a large investment. Still, some consumers consider the cost offset by its energy and water consumption reduction.